This pie only takes minutes to prepare and once it's frozen, Mama's recipe for key lime pie will cool you off on a hot summer day! 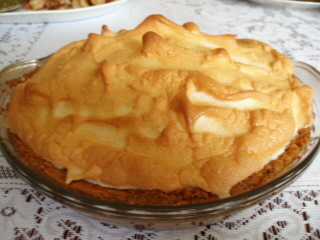 If you are not fond of meringue, you can always top this pie with whipped cream. Just leave out the part where you put it under the broiler. In a 9 inch pie plate, mix together the graham cracker crumbs and the sugar. Add the melted butter and mix well. Press into the bottom of the pie plate. Set aside. In a mixing bowl, with a wire whisk, whisk together the egg yolks and lime zest until the yolks turn green. Add the sweetened condensed milk and key lime juice. Pour mixture into the graham cracker crust. In a large mixing bowl with an electric mixer, beat the egg whites until foamy, add the sugar a little at a time while continuing to beat. Add the vanilla and beat until stiff peaks form. Pour on top of pie filling and spread o edges to keep the meringue from shrinking. Bake at 325 degrees F for 15 minutes. Bake the untopped pie in a 325 degree oven for 15 minutes. In a chilled mixing bowl, add whipping cream, sugar and vanilla. Beat with an electric mixer on medium speed until soft peaks form. Use to top individual slices of pie or top the whole pie if you are going to serve all of it. After pie has baked, cool and chill in the refrigerator for at least 2 hours. Pop in the freezer about 30 minutes before serving. 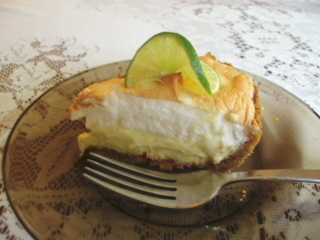 Mama hopes you enjoy this recipe for key lime pie!